Currently the top-ranked team in the world, the United States plays Jamaica on Sunday night in the semifinals of the CONCACAF women’s World Cup qualifying tournament. 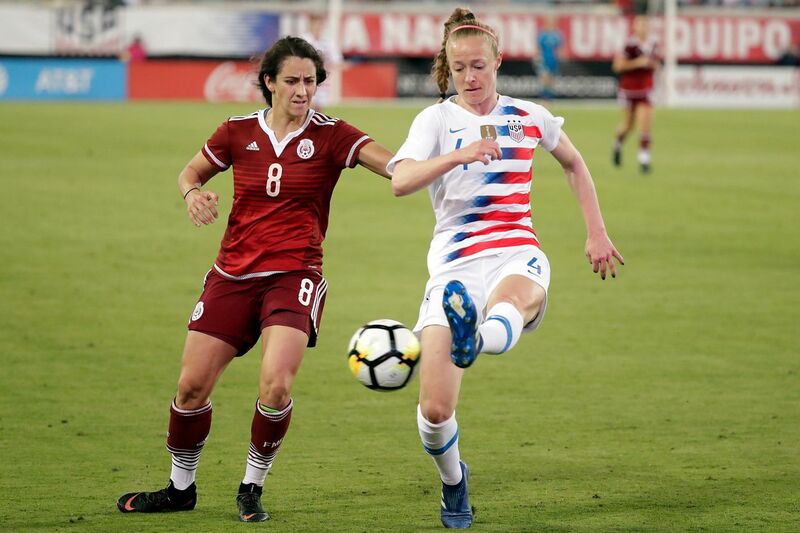 FRISCO, Texas (AP) — Defender Becky Sauerbrunn said the memories of 2010 still drive her as the U.S. women's national team seeks to qualify for next year's World Cup in France. The United States lost in the semifinals of that year's CONCACAF qualifying tournament, sending the team to a third-place finish and a two-legged playoff against Italy to secure a spot in the 2011 World Cup in Germany. Sauerbrunn was on that team. "For me, you just never know on any day. I think you see it in soccer all the time where the lesser team beats the greater team and it's the story and everyone loves it," she said. "So there are going to be a lot of people rooting against us, who want to see this kind of drama. Who want to see us face that. We don't want to face that." Of course, the U.S. went on to advance to the finals of the 2011 World Cup but fell to Japan. Currently the top-ranked team in the world, the United States plays Jamaica on Sunday night in the semifinals of the CONCACAF women's World Cup qualifying tournament (8 p.m., FS1 and Univision Deportes). With a win, the United States will secure a spot in next year's World Cup in France. The U.S. team in the defending champion of the sport's premier event, having won the final in 2015 against Japan in Canada. Canada, ranked No. 5 in the world, faces Panama in the other semifinal Sunday at Toyota Stadium, home of Major League Soccer's FC Dallas (5 p.m., FS1). The United States isn't leaving anything to chance. The team averaged six goals a game in its group stage. They've taken 114 shots, far more than the second-best team in the field, Canada (77). In their final group-stage match, the U.S. women out-shot injury-depleted Trinidad and Tobago 59-0 and had an 18-0 advantage in corner kicks. "The players know and obviously we know that this game is crazy. Every thing we have to do is earn the right to be there. So I don't think they're over confident," coach Jill Ellis said. "I think there's a tremendous confidence in the group, but before our first game actually, Carli (Lloyd), I asked her to speak to the group, and she said to take nothing for granted." All four teams could be impacted by rain forecast for Sunday in the area. Saturday's heavy downpours forced the U.S. team to practice indoors at the Dallas Cowboys' team facilities. "I think even if it is poor weather we can determine the tempo of the game, especially if we decide to go more direct. I think we can make it fast as we want or slow as we want," Sauerbrunn said. "For us I think we thrive at keeping a higher tempo and being relentless in the attack, and not letting teams breathe and get into their big attacking shape. So that's something I think we'll consistently carry through, no matter the weather." The top three finishers in the CONCACAF Women's Championship will represent the region in France, so the winners of both semifinals will earn a berth. The finals and the third-place game are set for Wednesday in Frisco. The fourth-place finisher will face Argentina in a playoff for a spot in France. Jamaica, ranked No. 64th in the world, is vying to become the first Caribbean nation to go to a World Cup. The Reggae Girlz upset Costa Rica 1-0 in the group stage before routing Cuba 9-0 to finish second to Canada in Group B.
Canada is looking for its sixth straight trip to the World Cup — the only one the team has missed out on was the first in 1991. A win on Sunday and the Canadians are in, no matter the opponent in the final. Like his U.S. counterpart, Canada coach Kenneth Heiner-Moller is not concerned about his team being overconfident against Panama, which is ranked No. 66 in the world. "I think we've been pretty good at taking it one step at a time, looking at the opponent right in ahead of us, and what we should be doing," Heiner-Moller said. "And then it's about playing a top performance, every time not matter if you play the best team in the world or someone who is not. It's our performance that we can do something about, and that's the standard we need to set every time we step onto the pitch."